Liesel is outstanding restaurant WordPress theme suitable for cafe shop, cake shop, dining, bar and bakery websites. Its WooCommerce ready WordPress theme built with multiple webpage layouts and supports custom navbar location / menu position. Bundled with most wanted visual composer page builder ($28), slider revolution ($18) premium WordPress plugins and featured with exclusive flipcard plugin supports flipping animation to build outstanding card. Each card can be customized to suit your need such as menu, recipes, product display and much more. Liesel restaurant / bakery WordPress theme included with landing page template to save your precious time to find the right landing page that actually works. The landing page template designed with the ability to use one page navigation, MailChimp, Contact form plugin, toggle menu, sliders and much more. Liesel WordPress theme enabled to support parallax animations and comes with portfolio custom post type to manage multiple portfolios, galleries, showcase events, menu, for your cafe / restaurant website. Able to display various post / page specific backgrounds as well as different header images (fancy header) as well. 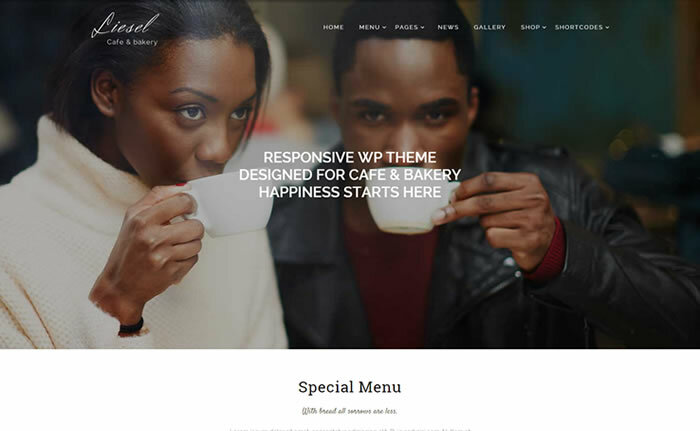 I have used liesel-cafe-dining-and-bakery-wordpress-theme and it is compatible with WPML. But when i activate WPML plugin flip card pop-up functionality donot work. I want to know how can i fix this problem ? May be its jquery conflict. Ask support from theme developer.